Author’s Note: This article is based on a program I gave at the Watson reunion in August 2014. I purposely kept the program short because of an acoustics problem in the room where we met. Much more could be said about each of the superstars. Superstars numbers one and two are the brothers William and John Watson, who came from Virginia to the Ridge in 1745. In the 1760s, the brothers and their sons were active in the South Carolina Regulators, a group of back-country settlers who fought back at other settlers who were attacking them. A citizens’ group which takes the law into its own hands is called a vigilante group, and the South Carolina Regulators were the first vigilante group in America. William and John Watson have thousands of descendants. Number three is Captain Michael Watson, the younger son of William Watson. He married his first cousin Martha Watson, a daughter of John Watson. Martha is number four. She was twenty-seven years younger than her husband. During the Revolutionary War, she rode all over the back-country, taking messages and getting supplies for her husband Michael. He was killed in the Revolution. Martha and her second husband, Jacob Odom, were hosts to George Washington on his tour of the Southern states in 1791 at their tavern near present-day Monetta. Every family has its black sheep, and number five, Edgar Watson, fills that role for the Watsons. As a young man, he left the Ridge and went West and then to Florida. Throughout his life he was implicated in several murders. In 1900, when the evidence against him became too great to be ignored, his employees and neighbors gathered at his home with weapons. When he returned by boat and saw them, he attempted to fire on them, but his ammunition was wet. The men on shore drew their weapons and killed Watson. In the 1990s, the writer Peter Matthiessen published three novels about Edgar Watson. Then Mattheissen combined them with additional material as a fourth novel titled Shadow Country. That novel won the National Book Award for 2008. Sarah Pressley Watson’s gravestone in Ridge Spring Cemetery. 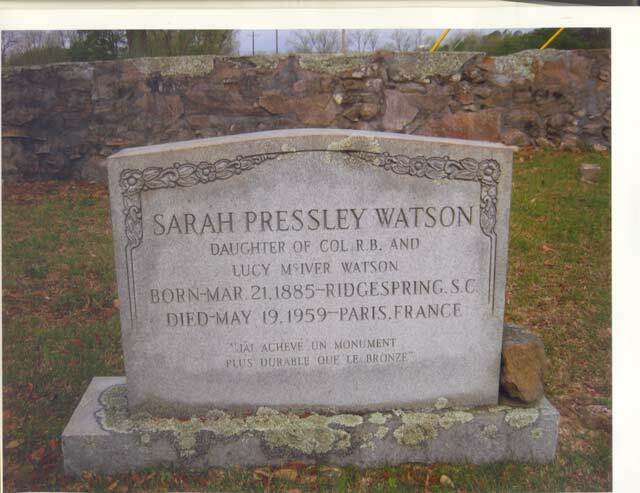 Sarah Pressley Watson is number six. She grew up in the old Watson house in Ridge Spring. After studying history and teaching college history, she went to Paris after World War I and became the director of a dormitory for foreign women attending the Sorbonne, a part of the University of Paris. She kept that job for almost forty years and was active in the Underground movement during World War II. She received an award from the French Legion of Honor for her work. Her ashes are buried in Ridge Spring Cemetery. 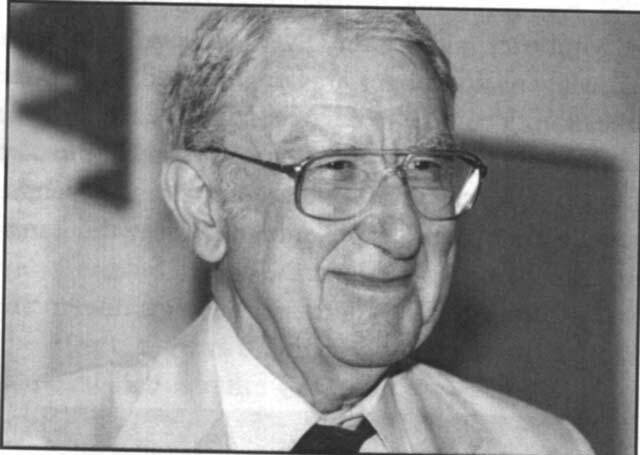 Number seven is Michael Cunningham Watson, M. D., who was at the Watson reunion in August 2014. Dr. Mike has spent most of his life as a physician in Bamberg, South Carolina. In two volumes of autobiography, he was told the story of his upbringing in Ridge Spring, his career as a small-town doctor, and his visits to Haiti as a volunteer physician representing the South Carolina Conference of the United Methodist Church. Joe Cal Watson at his business, The Nut House. Our eighth superstar is the host of the Watson reunion, Joseph Calhoun Watson, Jr. He is a veteran of the military invasion of Europe during World War II. 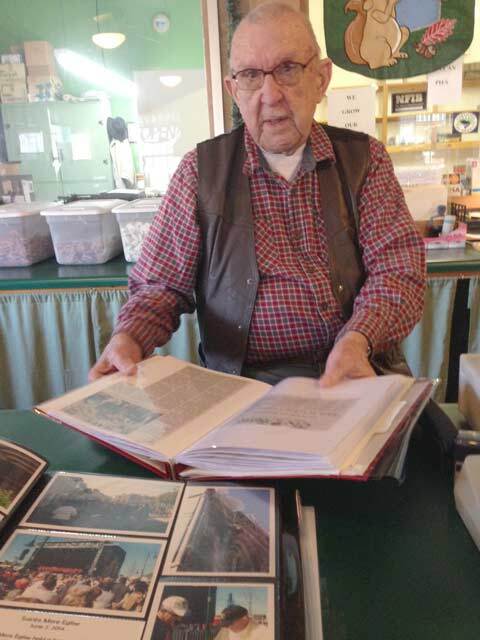 In the spring of 2014, he participated in Operation Overlord Seventy Years After, which followed the path of the United States forces from their landing in Normandy to the liberation of Paris. Joe has made more than Thirty-five trips to Haiti since 1969 as a Volunteer in Mission. 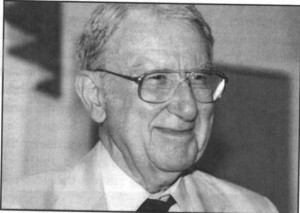 Not least, Joe has hosted the Watson reunion for many years. The program ended with applause for the two superstars who were present at the reunion – Dr. Mike Watson and Joe Watson.